Toto actually formed in 1976 but didn't release their self-titled debut album, which included their first hit, Hold the Line, until 1978. The current lineup of the band includes original members Steve Lukather, David Paich and Steve Porcaro along with Joseph Williams, who first joined in 1986 and has been currently with them since 2010. The tour band also includes Lenny Castro, Shannon Forrest, Warren Ham and Shem Von Schroeck. The current tour is broken down into three sections plus an encore. The first set opens with nine songs before breaking down for a seven-song acoustic set. The band returns for eight more songs in the second half before returning for an encore. 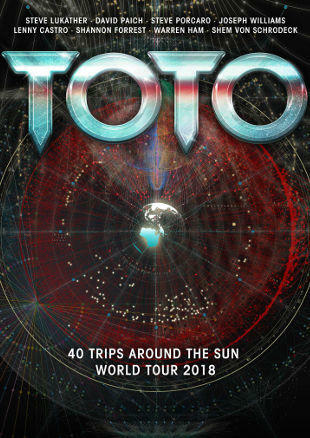 The set list features songs from all of Toto's pre-2000 albums along with the two new tracks from their 40 Trips Around the Sun album. There are also performances of songs co-written by Porcaro ("Human Nature" (Michael Jackson)) and Paich, Lukather, Porcaro and David Hungate ("Miss Sun" (Boz Scaggs)) and a cover of George Harrison's "While My Guitar Gently Weeps". What is missing from the set list are a few of Toto's best known songs. While they performed the now standard "Rosanna" and "Africa" along with their first hit, "Hold the Line", three additional major songs were missing from the show, "99", "I Won't Hold You Back" and "I'll Be Over You".